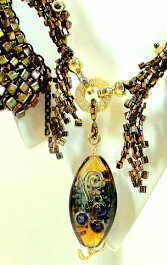 Several years ago, I began making high end, handcrafted jewelry. I anticipated my retirement many years down the road, and wanted to establish some activity now that would generate some extra income after I eventually close my shops. Coming up with a name for this business was difficult, as well. I settled on Warren Feld Jewelry – www.warrenfeldjewelry.com . Several things went into consideration here. I wanted to create a strong brand identity associated with my name. I wanted to make it difficult for other people to copy my business name. Since I anticipated that most of my business would be conducted on-line, I wanted a key word that search engines would see and associate with my business. However, I settled for a name configuration that is so common among jewelry designers – Your Name Jewelry – that it was not a name that would stand out as much, set me off from the pack as much, or be as memorable as much. Also, if I ever entertained thoughts of selling this business, having my name in the business name would probably be a negative. If you were starting from scratch, and trying to name your jewelry-making business, what things could you do? What factors are important? What do you want your name to communicate? What types of business names are jewelry designers currently using? If you do a Google search on “jewelry designers” or “directories jewelry”, you can come up with lists of names other people use. Most use the artist’s name and either the word “design” or the word “jewelry”. Susan Fein Designs. Susan Fein Jewelry. Susan Fein Jewelry Designs. Susan Fein Designed Jewelry. This has pros and cons. On the positive side, it’s important to get your name associated with jewelry, and a certain style, look and/or quality of jewelry. This is called branding. You always need to keep re-emphasizing your name. In terms of both positive and negative, this gives the search engines something to work with when indexing. The name is user friendly in that it is easy to interpret and understand. On the negative side, it seems that almost everyone you are competing with uses the same naming construct. If a potential customer is paging through the yellow pages, or scrolling down a list of designers in a search engine, you can get lost in the crowd. The Google search will also show you other types of business names jewelry designers use. You might also page through jewelry popular and trade magazines. Brainstorm. When making the decision about words and names, brainstorm a lot. Brainstorm with yourself. Your friends and family. Potential customers. In this initial part of the naming process, don’t reject anything. You want to pull out as many ideas as possible. You never know what combination of words and phrases might click. How would you describe your jewelry and your work and your design abilities? How would anyone else describe these things? What qualities do you want people to associate with your jewelry? Do you have a specific target or niche market? A target area? Demographic? Socio-economic group? How will your products benefit these target groups? Where do you see yourself in 3 years, 5 years, 10 years, 20 years? What will you be selling, to whom, at what price? Will it be the same merchandise you began with, or very different merchandise? Write down everything you can think of. Write down all the qualities you associate with your jewelry. All the materials you are using. The price points. Write down all the types of things you think you will sell – right now, a few years from now, many years from now. Available only through you, or at local stores? Write down everything you think makes your jewelry better than that of anyone else’s that your likely customer might buy. Better made. Better materials. Better designs. Better prices. More accessible. More sensitive to customer needs, or customer situations they find themselves in. Better colors, more relevant colors, more needed or wanted colors. What are your styles of jewelry? Sophisticated, every day, novelty? Gemstone, crystal, glass? Only one of a kind, or more mass-produced? In what settings will you sell your jewelry? Start Putting Words Together Into Phrases. From this list of potential key words and tags, start putting words together in various combinations. Say them out loud. Plug in some of these words into the GOOGLE or Yahoo browser bar, and see what other key words they are associated with. For some of your favorite words, you might look these up in different languages – French or Spanish or German or Italian or whatever. Check these words in a Thesaurus to find related words. For each 2 or 3 or more word combinations, do a Google or Yahoo search on them, and see what comes up. Are these the kinds of businesses you want your own to pop up with in an internet search? See any other words other businesses use that relate? Does it appear that no other business is using the same name you want to use? If you are marketing to a multi-lingual audience, will the words you use be recognized in more than one language, and will they be seen as positive and have no negative connotations? As you begin to narrow down a name, check with the US Trademark office to be sure no one else has used these names. Go to www.uspto.gov , and search the business names. Your state trademarks office may also have a searchable list. Check to see if anyone has registered your business name online as a registered domain name. Go to http://www.networksolutions.com/ or www.GoDaddy.com and type in the name you want. If the name you want is taken, you can always vary the domain type, such as “.net” or “biz” instead of “.com”. You can vary a name by adding punctuation like a hyphen or period or deleting a space between words. You can vary a name by making it plural. You can vary the name by playing with the spelling of certain words – even making up your own creative spelling for some words. Best names function on more than one level of understanding – a play on words. That is, a word or part of a word can convey more than one meaning, and each meaning can be appreciated. A business called “JewelryWorks” suggests that the jewelry is handcrafted, as well as successful – it works! – for the wearer. Your name choice can make your business the talk of the town, or doom it to obscurity. Keep your name choice simple. It should convey what your business does. It should be pronounceable and understandable by your target market. It should be memorable. Avoid tongue twisters. Avoid words that are more than 2 or 3 syllables. In most cases, avoid acronyms or names using initials, unless these are very meaningful to your customers. Your name should be flexible over time as your business grows and evolves. Avoid trendy names and amateurish or silly names. The best approach is to generate 3-5 business names, and start pre-testing them. Again, search Google, domain name registries and trademark offices. Show your friends and family members all 3-5 names, and ask them to pick their favorites, and tell you why. Type out the names, using different type-font faces. You can easily do this in your word processing or web-page editing software. How does it visually appear on the page, and do you like it or not. Hold your jewelry next to your name. Match? Mismatch? Say your business name out loud. How easily is it to say and pronounce and be understood? Have other people say your business name out loud. Does the name seem as workable for a physical bricks and mortar business, as it does for an online business? Think about how you intend to market your business – brochures, directories, ads, email campaigns – does your name feel good and fit with these marketing strategies? If your primary means of marketing is a listing in the Yellow Pages or some other directory, then the first letter of the name might be important. Should your business start with the letter “A”? Should your business name avoid the “a”, “an” and/or “the”? Will the name limit you in any way over time? Have you chosen something like Tennessee Jewls, and may want to sell outside Tennessee, or have non-Tennessee products to sell? Do you think you might want to expand beyond jewelry? If you have an identifiable major competitor, does your business name sufficiently distinguish you from them? Pick your business name. People often make snap judgments about your business based on your business name. Your business name can often make or break your success. Protect your business name by registering the name as a trademark or service mark. Also copyright your brochures and advertising copy, and any sets of instructions, if you create these. US as a whole, offer opportunities to protect your trade or service mark. In Tennessee, this process is especially inexpensive – around $40.00 per trade or service mark. You can prevent someone else from using your business name, or product name, by registering this name with the state(s), or US. You would put a TM next to the name you’ve trademarked, such as Be Dazzled BeadsTM . Getting a US trademark is expensive, and I’d suggest using the services of a trademark lawyer in this case. You can copyright any documents or marketing materials (brochures, instructions, etc). You can do this by registering a copy with the Library of Congress, or just putting © YOUR NAME, date somewhere on the document. Or you can send a copy to yourself in a Registered letter, write on the outside of the envelop what is inside, and don’t open the envelop when you receive it back in the mail. This is a proof of date, should you need to challenge anyone. Next, register a business domain name, so that you protect your business name from other people who might use it on-line. In translating your business name to an internet domain name, keep in mind that your email address will include that domain name. You want people to be able to easily and quickly type in your email address into an email. You do not want people to confuse the spelling or any added punctuation. Determine how you want emails to be directed to you. Never use “info@yourname” or “customerservice@yourname” or “webmaster@yourname” or “store@yourname” or “mail@yourname” and generic things like that. These too often are challenged by spam prevention systems as spam. You don’t want your customers’ email systems automatically deleting your emails. On written documents, brochures, stationery, envelopes and on online documents with titles, headings and the like, you have an opportunity to present more “words”, that is “meanings”, about your business. This gives you a second opportunity to convey things about your business that perhaps your specific business name falls short on, or needs more emphasis. After you’ve come up with a business name, return to your lists of key words, and not-so-key words, and think of a tag line. First write a 9 words or less tag line. Settle on a final draft. Then, come up with a 25 word description of your business. Then, come up with a 100 word description of your business. Last, come up with a 250 word description of your business. All these will be useful, when creating written documents, as well as web-pages, and, just as important, will be useful for filling out forms to register your business name with various search engines and directories. I find it useful in increasing attention and sales to name my jewelry. I name each piece of jewelry, and organize similar pieces of jewelry into collections and series. This helps people relate to the various pieces I make. They get connected to my pieces because the “titles” give them meanings to relate to. Naming allows me to segment all the jewelry I make into smaller subsets. This enables me to explain techniques and materials pertinent to particular pieces, so I don’t end up, in my sales pitches, making broad generalizations about what I sell. And I find people often like to own more than one piece within any series or collection. People are natural “collectors.” The familiarity these names generate seems to encourage people to want to own a second or third piece of mine. and of All Dolled Up: Beaded Art Doll Competition. This entry was posted on April 28, 2009 at 8:28 pm	and is filed under business of craft. Tagged: business of craft, craft business, handmade jewelry, jewelry, jewelry designer, jewelry websites, marketing jewelry, naming business, naming jewelry. You can follow any responses to this entry through the RSS 2.0 feed. You can leave a response, or trackback from your own site.